Between the post-holiday travel and getting back into the swing of things at the office, the start of the New Year can be a hectic time to keep up with . . . well, anything in the world. But as they say, there’s no rest for the weary, and chefs and restaurateurs in San Francisco have been taking 2019 by the horns and opening up new eateries throughout the Bay Area. From fast-casual mega projects to a widely-anticipated rum bar, here are five new restaurants in San Francisco ripe for the taking. Omakase Restaurant Group (Dumpling Time, Omakase and Okane, among others) debuted their 41-seat fast-casual noodle shop specializing in customizable bowls of udon in the trendy SoMa neighborhood last week. 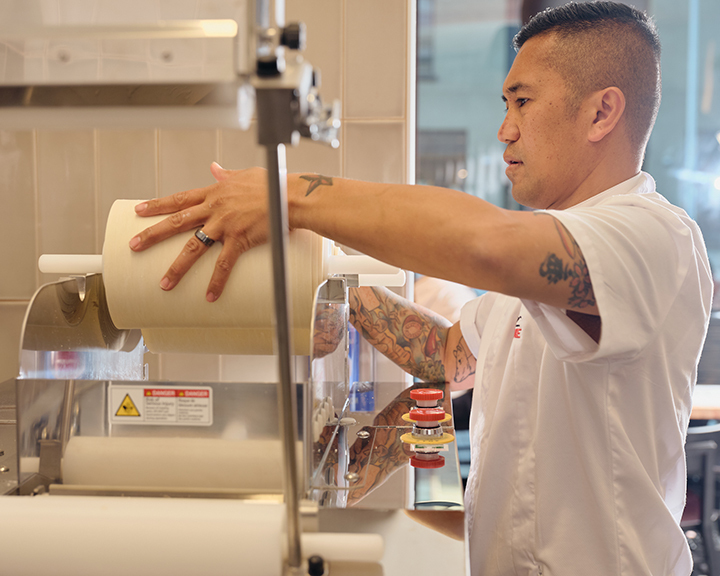 Helmed by executive chef Edgar Agbayani—who trained at the Sanuki Menki Noodle School in Kagawa, Japan—the noodles at Udon Time are slightly thinner and have been aged overnight before being prepared on-site in a Sanuki noodle maker. Broths, too, are made in-house; the Sanuki udon is swimming in the “signature” broth with green onion, wakame and tempura flakes (and can be served hot or cold), while the Kamatama bowl features Jidori egg, soy sauce, Parmesan and butter. A selection of tempura, onigiri and salads are also on offer. Five years in the making, Bar Agricole and Trou Normand’s Thad Vogler debuted his much-anticipated rum bar in the Mission just in time for the New Year. Named for a street in Havana where Vogler once lived, Obispo is an ode to the complete history of rum—indeed, you’ll find Jamaican rums, Cuban-style rum and rhum agricole stocked behind the bar, while plates include jerk chicken, oxtail curry and Cubano sandwiches. Vogler also partnered with the Museum of the African Diasporsa, as well as the Calle 24 Community Council for the project; both will receive some of the proceeds. Heading out of SFO? Stop by the Manufactory Food Hall, a collaborative project from Tartine’s Elisabeth Prueitt and Chad Robertson, Cala’s Gabriela Cámara and Kin Khao’s Pim Techamuanvivit, in the International Terminal. The vast food hall is well over 3,000 square feet, complete with both a to-go counter and full-service dining room. Indeed, you’ll find all your favorite Tartine Manufactory favorites, as well as tacos, tostadas and tortas at Cámara’s Tacos Cala, and casual Thai fare—think fried chicken sandwich with sriracha mayo and Khao Soi tofu—at Techamuanvivit’s new Kamin. Hero image courtesy of Udon Time Facebook page.